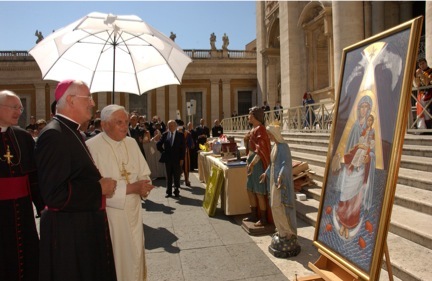 Natidallospirito.com presents to you an interview given to us by an important iconographer Stéphane René. Born in France, Stéphane René (deacon Stephanos), after embracing Orthodoxy, has become a leading exponent of the Neo-Coptic School. 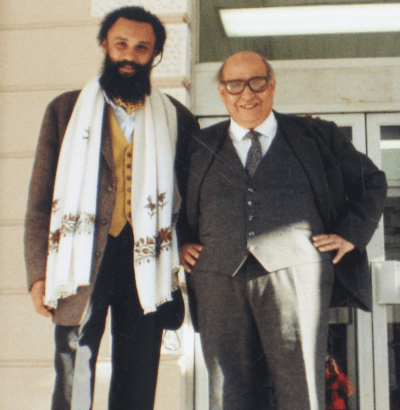 He studied under the school’s founder, Prof. Isaac Fanous, at the Institute of Coptic Studies, Cairo, and received his PhD from the Royal College of Art, London. He works and lectures internationally. His work can be found in the USA and Europe. Dr. René teaches in London and leads workshops internationally. He has been associated with the Prince’s School of Traditional Art (PSTA – formerly the Prince of Wales’ Institute of Architecture) since 1993 where he supervises doctoral research in Christian art. Stéphane is the director of Sacred Space Gallery at St John’s Notting Hill, London. He was born in France and lives in London with his wife Monica. 1. How did you become an iconographer? My interest in iconography started with my conversion to Orthodoxy some 30 years ago, but I had always been interested in art as far as I can remember. 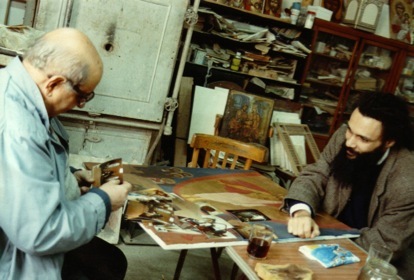 I first saw the icons of Isaac Fanous in St Mark’s Coptic Orthodox Church, London, in 1982. They resonated deeply with me; their timeless beauty and exquisite simplicity made them very powerful, even beyond words. One Sunday in June of the same year, at the suggestion of my dear departed priest Abouna Antonios Farag, I was ordained a deacon by H.G. Bishop Misael. In the space of a few weeks we found ourselves quite literally ‘catapulted’ to Egypt, on our first trip of many. We stayed at Fr Antonios’ apartment on the ever busy Shara Ramses, just a short walk away from Cairo’s St Mark’s Coptic Cathedral complex and the Institute of Coptic Studies, and, unbeknown to us at the time, merely 3 doors away from Prof. Isaac Fanous. While focusing my attention on the icons during the liturgy in the London church, I remember thinking that if I ever had the opportunity to visit Egypt I would make it a special point to meet the man who created these beautiful works of faith and art. 2. I have read on your website that you have been a disciple of Isaac Fanous. Can you tell us more about that? I am a disciple of Isaac Fanous and will always be one. I first met Dr Isaac when I visited the art studio at the Institute of Coptic Studies (ICS), Cairo, where he had worked since the mid 50’s. The studio was in effect ground zero, where the revival of Coptic iconography happened; there was a certain sense of historicity about the place. There was a row of icons on display that he had just completed for an iconostasis; the warm glow of the golden flesh tones and the brilliant, yet soft light suffusing the compositions were at once comforting and awe inspiring. I can say that the day of my first meeting with Dr Isaac is fixed in my mind as the moment I heard the proverbial ‘call’. He invited us both, my wife Monica and I, to study with him for one year at the Institute. While I would study the practical side of icon painting with him in studio, Monica, a journalist/photographer, would record and catalogue Coptic heritage. I explained that living in London, it would be difficult… and we would try to return soon etc… In fact we spent 8 years going back and forth for up to 6 months at a time. I was in studio most of the time but also travelling around the Coptic sites and monasteries with Monica. In 1986, under the supervision of Dr Isaac, she started a project cataloguing the art of Abu Sifain’s Church in Old Cairo, a huge undertaking but well worthwhile. It was during this most important and precious time in the studio with the master that I became acquainted with the techniques and principles involved in the contemporary style of Coptic iconography. 3. Why is Isaac Fanous important in the history of Coptic iconography in your opinion? Isaac Fanous is undoubtedly the greatest Coptic artist of the 20thc. His achievement,in terms of his artistic legacy, is beyond comparison. Only the heyday of Byzantium or the treasures of ancient Egyptian art could come close. His establishment of a new canon is unique in the Orthodox Church (Eastern or Oriental). To call him a mystic of the highest order would not be too far fetched, even though he would certainly joke it off, saying he is only a simple man living a simple life: ‘ana maskeen awi’ he would say with great humility. But if the description of a mystic is one whose spiritual eyes have been opened, then he was indeed one, or at least a true visionary. Even the masterpieces of Coptic art from Bawit and Saqqara or the beautiful frescos of St Anthony’s monastery do not quite compare with the impeccable order and superb harmony of form and colour in Fanous’ work, mixed with a mature and potent symbolic system. So to answer your question: yes, Fanous is central to the history and development of Coptic iconography and is a crucial bridge between the past and the present. He, so to speak, gave Coptic iconography a second birth. Until Fanous, icon making had been mainly artisanal in nature and very often intuitive rather than formally studied under a master or school. There are consequently many styles of iconography in Egypt, according to the different regions and periods. The style of iconography found in the Delta region for instance, is very different from that found at Akhmim or further south. The Neo-Coptic style fathered by I. Fanous is probably the first attempt at a ‘unified’ Coptic style, valid from Alexandria to Aswan as well as the worldwide Coptic Diaspora. When I started to study with Dr Isaac in 1982-83, there was scant interest in Coptic iconography among the Copts themselves. One of the few serious regulars at the ICS studio was an English lady living in Cairo with her journalist husband. She eventually did a PhD under Fanous at the ICS during the 80’s. For whatever reasons, cultural or otherwise, art is not encouraged in the Coptic Church; it is mostly seen as a hobby, or something one does in one’s own spare time, outside a ‘proper job’. This kind of attitude does not foster artistic creativity. It is no wonder that iconographers in Egypt often come from other countries or other Christian traditions. On the whole, the transition between religious painting and sacred iconography has been (and still is) quite difficult and painful for the Coptic people. The Roman Catholic pious images introduced into Egypt by the foreign missionaries in the mid 1800’s, have been the dominant imagery for generations of Copts and are still very much part of the collective psyche. It has been a slow and uphill struggle to promote a change towards the more authentic sacred art form of iconography championed by Fanous: “We fight against ignorance” he’d say. Salut scrii bine te-ar interesa un schimb de linkuri cu siteul meu?